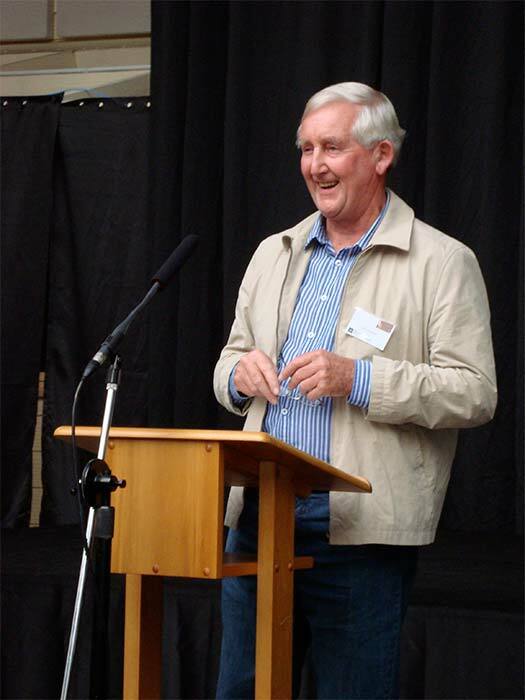 Allan Gillingham, an agricultural scientist, was Te Ara's Settled Landscape theme editor. He is seen here at the launch of the 'West Coast' entry. Gillingham was born on the Coast, and his baby photo and Plunket book appear in the entry. My involvement with Te Ara began in the early days of my retirement with a call from Jock Phillips to ask if I would consider applying for a position as editor for the next theme that Te Ara was developing, The Settled Landscape. This would include the early history of and subsequent developments in the New Zealand pastoral, horticulture and forestry industries. My first reaction was of the size of the task. However, following further discussions with Jock, and gathering a better appreciation of what was required, I felt more comfortable in applying for the position. This was supported by my experiences during more than 40 years in agricultural research and research management. During that period I had met and/or worked with scientists, technicians, farm consultants, farmers and commercial agricultural and forestry people in a wide range of disciplines. These contacts were to prove valuable when searching for authors to write contributions on different topics within the theme. In fact some of these people I had not contacted for many years – so it was an excuse for considerable reminiscing about old times when they were first approached. One of the things that I enjoyed most in my research career were the occasions when a team was put together of people with different skills and backgrounds, who each brought a different perspective to the project. This was one of the things that I enjoyed most about working for Te Ara. In one room we had a range of people with quite different skills that were applied to each topic as it was developed. Each added value, and contributed in their own way to making the final presentation crisp, to the point and alive with the aid of graphics and photographs. In achieving this, the over-riding atmosphere was one of enthusiasm, teamwork and enjoyable collaboration, led by Jock, who was at ease and in control whatever the subject. All in all, a memorable and fulfilling experience that I will always treasure.